What is the Ridgeline comfortable towing ? I presume they have the best ride . 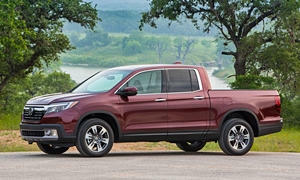 Is a Ridgeline Quiet ? Or does the engine have to work so hard that it is tiring ? How slow is the Ridgeline when passing cars on a 2 lane US Highway ? Towing - Both the Gen 1 and Gen 2 are comfortable towing up to the 5k limit. However, like all trailering, the type of trailer makes a big difference. I tow a 4,500 22 ft boat with the Ridgeline and it does fine - it's very aerodynamic. Good control of the trailer, etc. A bulky box trailer or camper will have significantly more drag and be a tougher tow. The independent suspension will have a little more sag (althought only about 2 inches with a 500 lb tongue load). I've towed with my RAM EcoDiesel and certainly the diesel is less strained than the Ridgeline (I've owned a Gen 1 2010 and currently own a new 2017). However, I had a 2014 RAM 1500 with the Hemi and that wasn't significantly better than the Ridgeline with this boat. I was a little surprised that the Hemi had to work with this load as much as it did (although never strained to the max). I believe Honda is pretty conservative with the tow rating - more to due with the independent suspension that the actual ability of the engine to supply adequate power. If I towed a lot, I'd have kept the EcoDiesel but I tow less than 1,200 miles a year (and half is with single Sea Doo which could be towed with my wife's VW Tiguan). Quiet - The Gen 2 Ridgeline is the quietest truck I've ever owned and the EcoDiesel mentioned above was super quiet. The active noise cancellation (ANC) makes sure on top of everything else. Althought you need to go RTL or up on the trim to get the acoustic windshield. Engine - Very relaxed in 90% of driving and it's a Honda with VTEC, so when you rev it up over 5,000 rpm, it's awesome. 70 mph cruise is at 1,900 rpm. Barely working to maintain normal cruising speeds. Passing - Not an issue and with the VTEC kickover, the Gen 2 Ridgeline has genuine "pin you back in the seat" power. Remember, this is the fastest midsizer by nearly a second 0-60 and even a half second quicker to 60 mph than a RAM 1500 with the Hemi. Very quick from a standstill and 30-50 mph or 50-70 mph. I've told my 25 foot travel trailer with no trouble with my Ridgeline. I've told it over several Colorado passes, some as high as 12,000 feet. When towing up the passes,the engine noise is a bit louder because I do so in second gear. I start out in third, put the truck on cruise, and then step on the throttle until it downshifts to second. I never have to worry about the throttlefrom that point on. We just took a trip in our Ridgeline from Amarillo to DC and back. I got just over 21 miles a gallon, keeping my speed to 68 miles an hour (2000 RPM). The ride was very comfortable, but the truck is somewhat noisier than my Ford Fusion hybrid.